^ a b Nicolas Delauney, AFP (10 February 2019). "Kagame steps down, Egypt's Sisi takes helm at African Union". Yahoo News. Retrieved 10 February 2019. ^ a b Charles Omondi (10 February 2019). "As Kagame steps down, Egypt takes helm at African Union". Daily Nation. Retrieved 10 February 2019. ^ "Pres Mnangagwa leaves for AU Summit". Zimbabwe Broadcasting Corporation. 8 February 2019. Retrieved 8 February 2019. ^ "Egypt's Sisi to travel to Ethiopia on Saturday to assume 2019 AU chairmanship". Ahram Online. 8 February 2019. Retrieved 8 February 2019. ^ "Egypt's President to Chair African Union in 2019". Sputnik. 29 January 2018. Retrieved 8 February 2019. ^ a b Cambanis, Thanassis (22 May 2015). "Egypt's Sisi Is Getting Pretty Good … at Being a Dictator". Foreign Policy. Retrieved 25 July 2017. ^ Fahimaug, Kareem (6 August 2014). "Egypt Has Ambitious Plan for Suez Canal Expansion". The New York Times. Retrieved 26 April 2016. ^ "Sisi says austerity measures 'a must'". Cairo Post. 7 July 2014. Retrieved 26 April 2016. ^ "السيسي: مصر لن تتأخر في الدفاع عن الدول العربية - العربية.نت الصفحة الرئيسية" [Sisi: Egypt will not be delayed in the defense of Arab states] (in Arabic). Al Arabiya. 31 October 2015. Retrieved 26 April 2016. ^ "Saudi Arabia futuristic robot city includes former Egypt islands". Archived from the original on 30 October 2017. ^ "Egypt's Sisi congratulates US President elect Donald Trump". Ahram Online. 9 November 2016. Retrieved 9 November 2016. 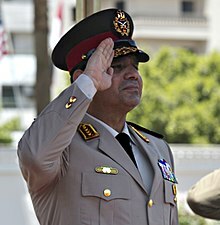 ^ "Sisi declares himself Egypt's God-send". Archived from the original on 14 June 2015. Hessler, Peter (2 January 2017). "The shadow general : President Sisi has unwittingly revealed more about the way Egypt now works than anyone could have imagined". Letter from Cairo. The New Yorker. 92 (43): 44–55. Online version is titled "Egypt's Failed Revolution". Unless otherwise specified, all cabinet members are Independent party members. This page was last edited on 23 April 2019, at 18:21 (UTC).